Life can get hectic at any point during the year, but this is especially true during the holidays. 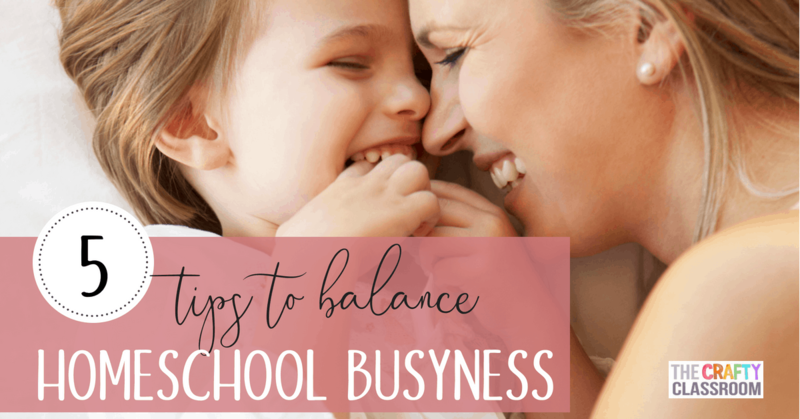 While most of these tips are written with Christmas in mind, they can apply anytime your school year gets busy. 1) Learn to say NO. Volunteer opportunities abound during the Holidays, particularly at church. 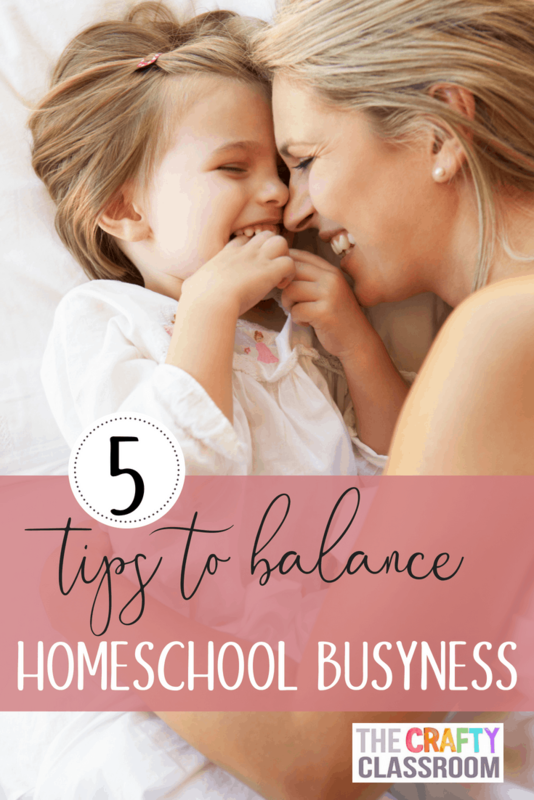 Homeschooling takes as much time as a fulltime job. Be very cognizant of not putting too much extra on your plate during this busy time. It’s okay to just say no. 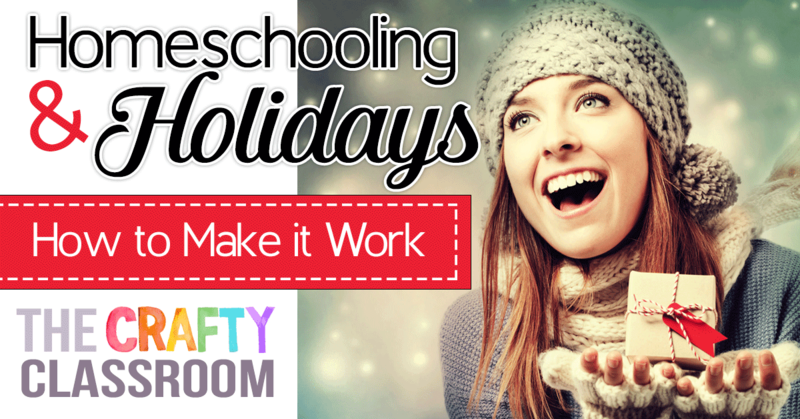 It’s best if you plan for time off during the Holidays before you even begin the school year. Working a vacation into your lesson schedule will be a major sanity saver. Try your best to make it happen if you can. 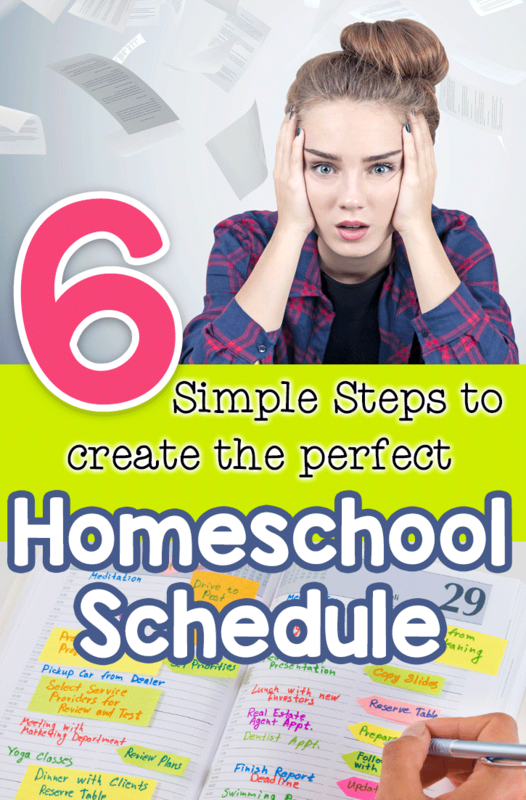 Read tips on Homeschool Scheduling Here. When kids are dreaming of Santa and sugar plums it will be harder for them to concentrate on their lessons. Getting ahead in favorite subjects can be a fantastic way to make this distractible time work for everyone. Better yet, try out our Holiday SMART Packs. They provide you with fun, thematic, educational content for an entire week. Even when your kids aren’t in classes, independent reading time is a great way to keep them in learning mode. Take a trip to the local library and pack in some holiday themed books! I know my children love to learn about the origination of each holiday or holidays in other countries for example. There are plenty of ideas online with learning games for every grade. Put some prep work in the night before and get your kids playing games that will teach them at the same time. 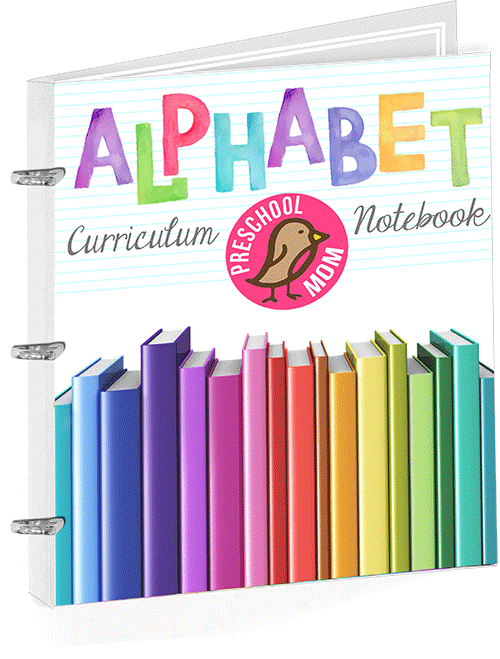 ABCya and MathPlayground are two of our favorites. If there are any chores you feel comfortable eliminating for a few weeks, do it. There are plenty of nonessential things that can wait until the holidays blow over. 7) Swap sitting or hire a sitter. Between parties, and Christmas gifts sometimes you just need extra help. If a sitter isn’t in your budget consider swapping sitting time with another family. I love getting out of the house and shopping for presents, but let’s be honest online shopping can be a huge time saver. When you’re trying to homeschool through the holidays Amazon Prime is worth the price. Try Amazon Prime Free for 30 days Here. Logistically, sometimes it’s easiest to have the family with the biggest family, or smallest baby host the Christmas party. Consider however the amount of time and deep cleaning that will go into hosting your event. If someone else is willing to host, consider letting them. Don’t let life get too hectic. Take time to sing, bake cookies, read books, make art project and absorb the season. Get plenty of pictures, and try to remember the smiles for years to come. BONUS TIP: Try out our Holiday S.M.A.R.T. 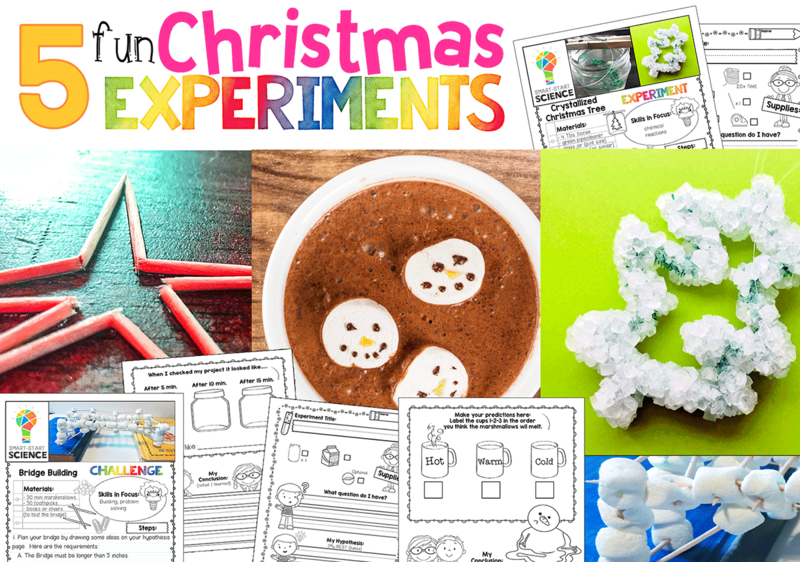 Packs for an entire week’s worth of engaging holiday learning! 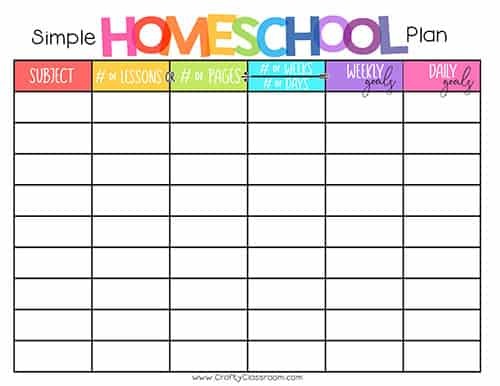 This set of simple homeschooling resources is intended to help you simplify your goal setting, curriculum shopping and daily schedule. Today, we are offering this small collection FREE for all of our newsletter subscribers. 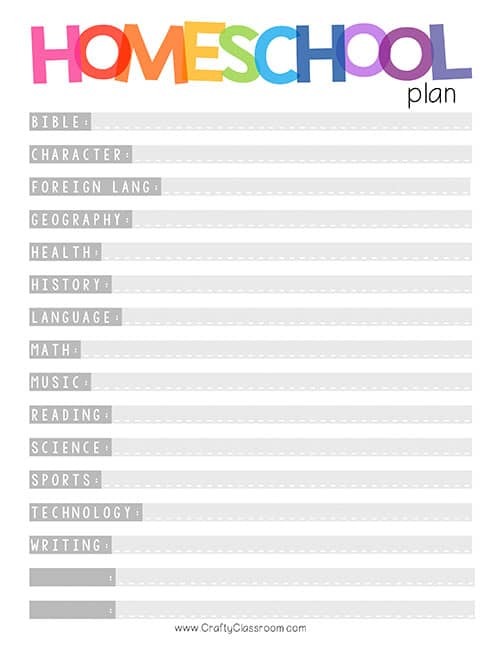 Homeschool Goals: Sometime before you start your curriculum planning we suggest sitting down and writing out your goals for each student. This doesn’t have to be detailed, it can be as simple as, “Get through 5th grade math.” However, there may be subjects that you have more detailed answers for, “Develop empathy and self control.” Doing this for each student is a great way to customize their education. Homeschool Curriculum: Print one page for each student and use this sheet to keep track of what products, resources and classes you’ll be using during the year to cover each subject. 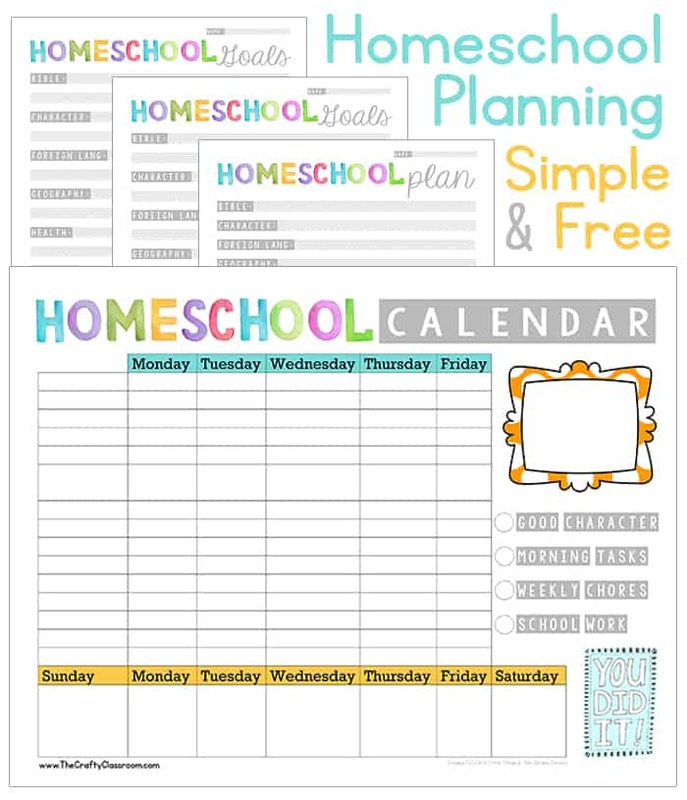 Take this sheet with you to homeschool conventions and curriculum sales so you can always update and keep organized. 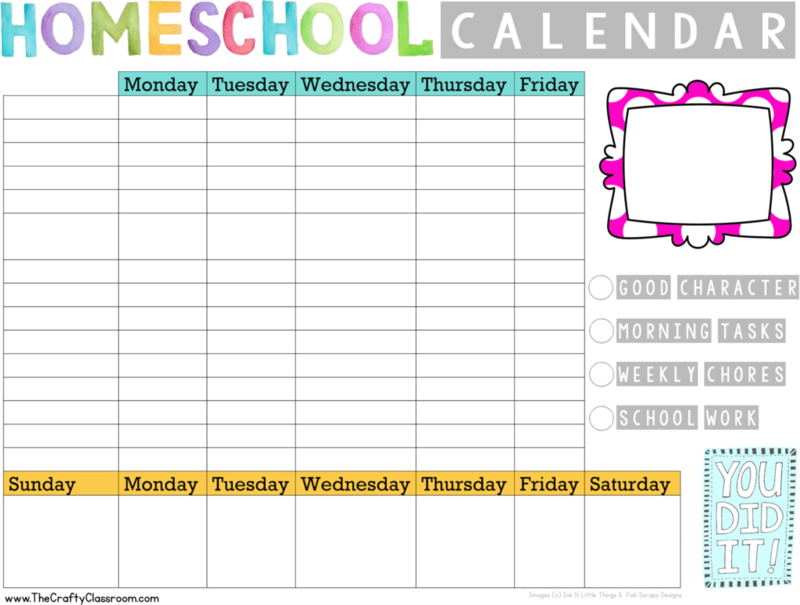 Homeschool Schedule: This sheet is intended to be an independent planner for your students. Print and add in your daily subjects and a photo of your student. Laminate or store in a page protector then provide your student with a dry erase marker to keep track of their daily tasks. Encourage students to mark off the boxes as they complete each task. 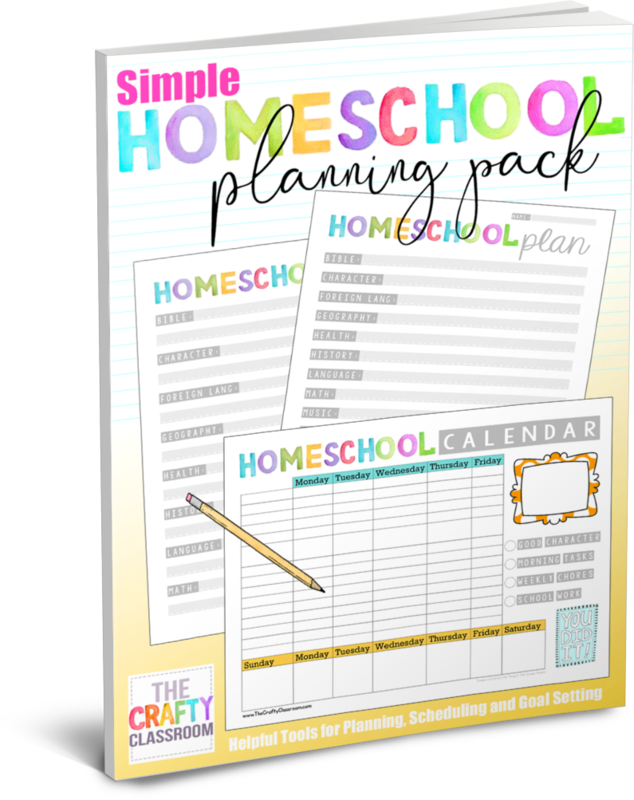 It’s August and that means Homeschool Planning! 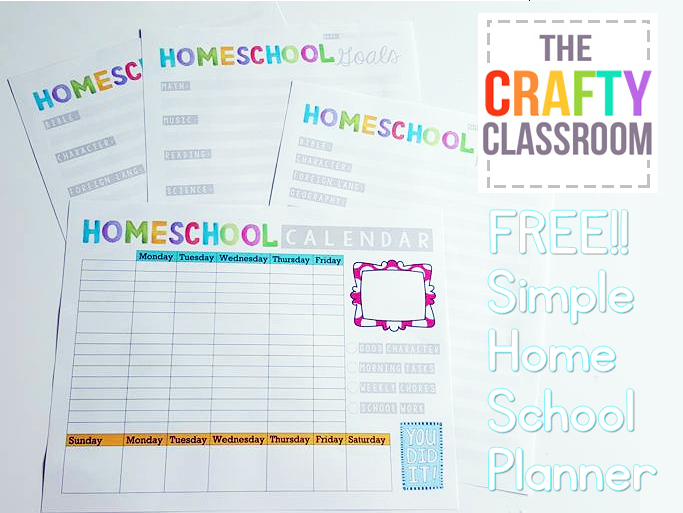 Over the years I’ve created a variety of Free Homeschool Planners, Goal Tracking Worksheets, and Curriculum Guides so I thought I’d share them here easily in one post! Still looking for that perfect curriculum? 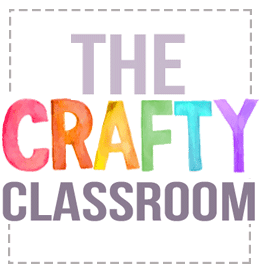 Check out The Crafty Classroom eStore! If you have a young child entering a new school year, this is a great opportunity for them to share about all their favorites and what makes them unique. 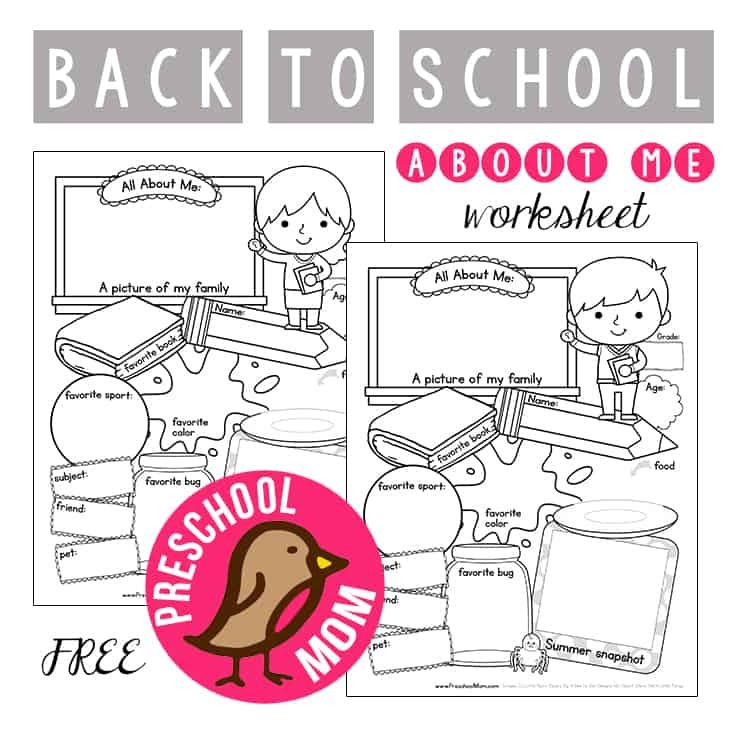 Today I’ve designed two different keepsake worksheets (one for a boy and one for a girl) for children to color and fill in with all their favorites. There are lots of spots to fill in, I suggest younger children can draw most of their answers or you can write them in for them. 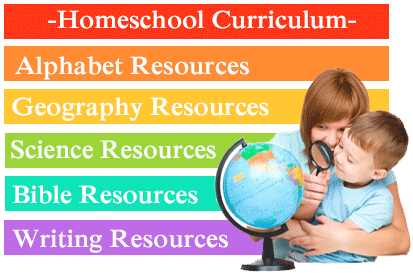 Many of you have already started your 2015/2016 Homeschool Year. 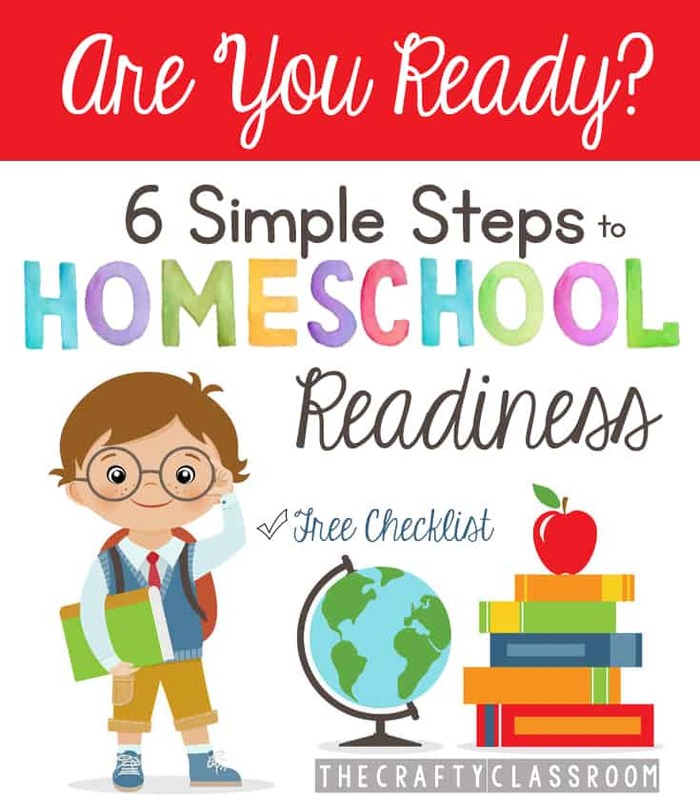 We’re gearing up to start in less than two weeks and that means it’s time to get things in order and make sure we’re ready to go on our First Day of Homeschool. Every year I go through a similar process to get ready and it works pretty well for me. Gathering Information. This step is usually the longest step as is involves carefully collected information throughout the previous year. I’m always paying attention to what works and doesn’t work for each child, as well as new curriculums I might want to try out next year. I usually keep a Pinterest Board or a Bookmarked list of things to look at when it’s time to order. 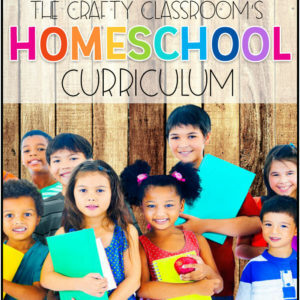 If this is your first year homeschooling, gathering information would involve talking with other homeschooling families, visiting forums, researching curriculum publishers, reading about homeschooling methods….etc. Making Goals: One of the benefits of homeschooling is customizing your children’s education to suit their individual needs. 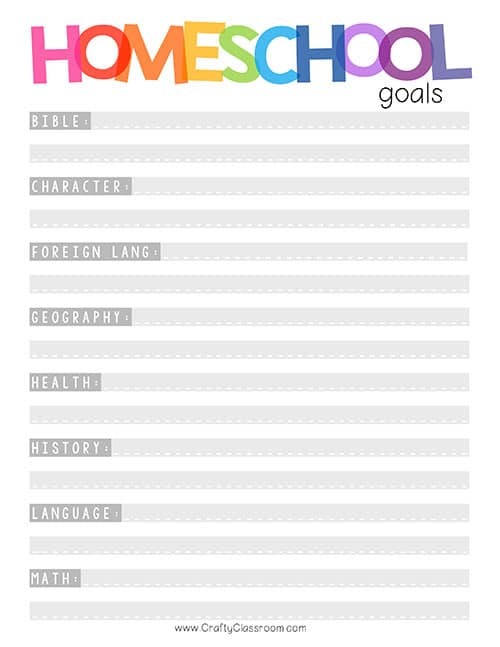 Use this Goals Sheet to list out personal goals you’d like each child to complete by the end of the year. Older students should be involved in the goal setting, and if you need somewhere to start try looking up the requirements of your child’s grade level online. Coming up with a Plan: After you have a general idea of what you want your end result to be, it’s time to make a Plan! 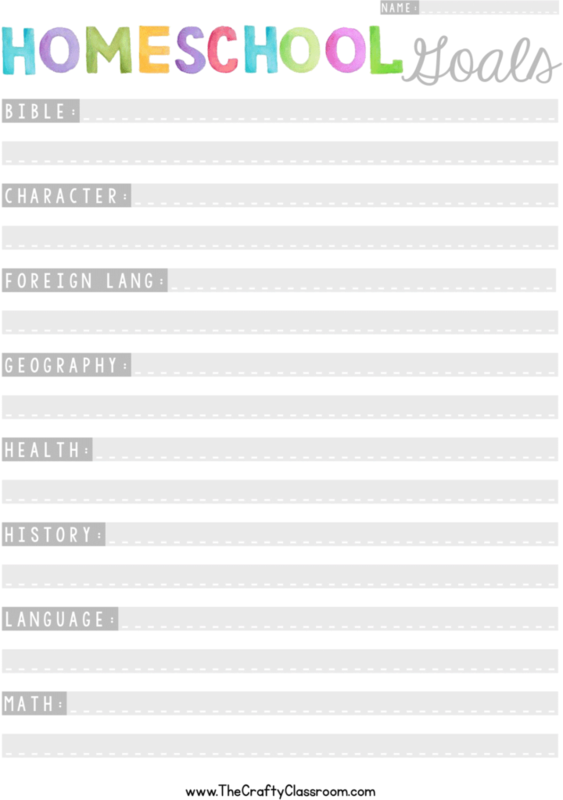 Use this Planning Sheet to list out your current inventory (books, curriculums, digital downloads etc…) that can be utilized to reach your goal. This is an important step, as homeschoolers (myself included) tend to collect (and forget about) educational items all through out the house. Making what you already have work for you is a great way to stretch your homeschool budget. 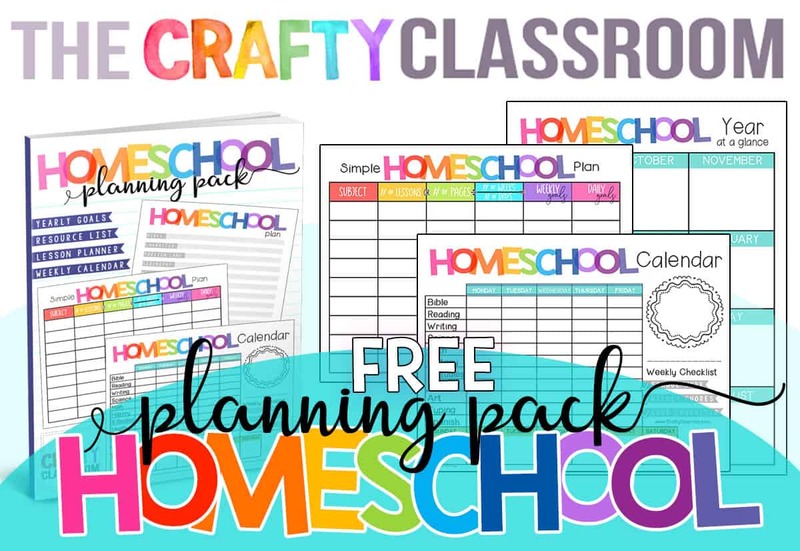 Organize a Homeschool Space: I’m not talking about redesigning an entire homeschool classroom here, but just clearing off a shelf or a basket or something for your children to keep all of their materials in. In my house each of my children have their own small shelf to store their school books and items. Every year this shelf starts out wonderfully organized and Homeschool Magazine perfect. And at the end of every year it is a Monstrosity. Make it fun to clean it up!! It has become tradition around here to have a Homeschool BURN day…..in which we collect all unnecessary and unkeepsake worthy items that cannot be reused and place them in our burn pile for Winter. You can imagine the giddy smiles of my children as they burn their Algebra homework, and watch their tear soaked papers go up in flames. It is strangely cleansing and therapeutic at the same time. If we homeschool 5 days a week for 36 weeks that 180 teaching days. The remaining 30 days remain for the different hands on activities, quizzes and tests which come up through out the year. 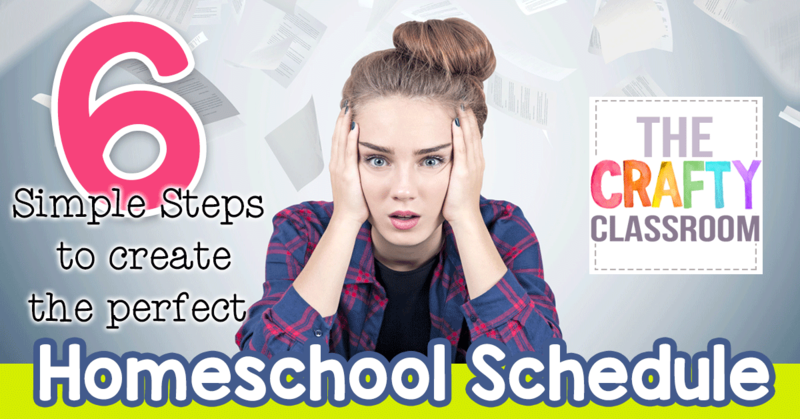 I repeat this method for most of our curriculum and that way my children can work their way through their books, we can miss a day or reorganize something and we don’t have to rewrite the entire schedule….everything just shifts over a day. Bonus Step: Get yourself to the nearest Spa. You’ve earned at least a mani-pedi if not a cut and color too. Looking Good, Feeling Good…and ready to start your year! 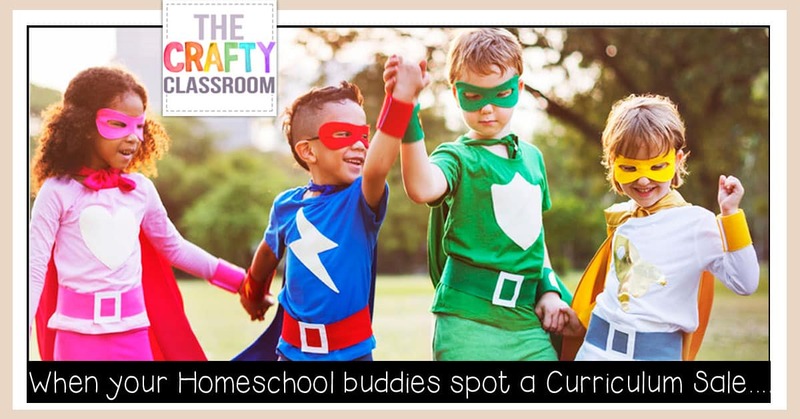 If you are looking for encouragment during your homeschool journey, my friend Jamerill Stewart has an amazing resource to share with you today. “Hope. Encouragement. Sanity. On any number of homeschooling days, I’ve needed all three. It’s not that homeschooling is an unwanted chore. Homeschooling my children is one of my greatest joys. It’s a privilege. I’m so incredibly blessed by this undertaking. And I’m challenged. I’m pulled. I’m stretched. I’m growing. I’m finding my reheated coffee in the microwave at 2 p.m. wondering where the morning went. Trying hard to soak up the sweet and sacred moments with these souls and miss stepping on the Lego pile in the process. 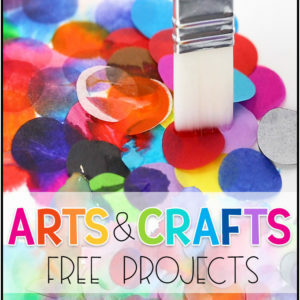 Grab your free Kindle eBook here! 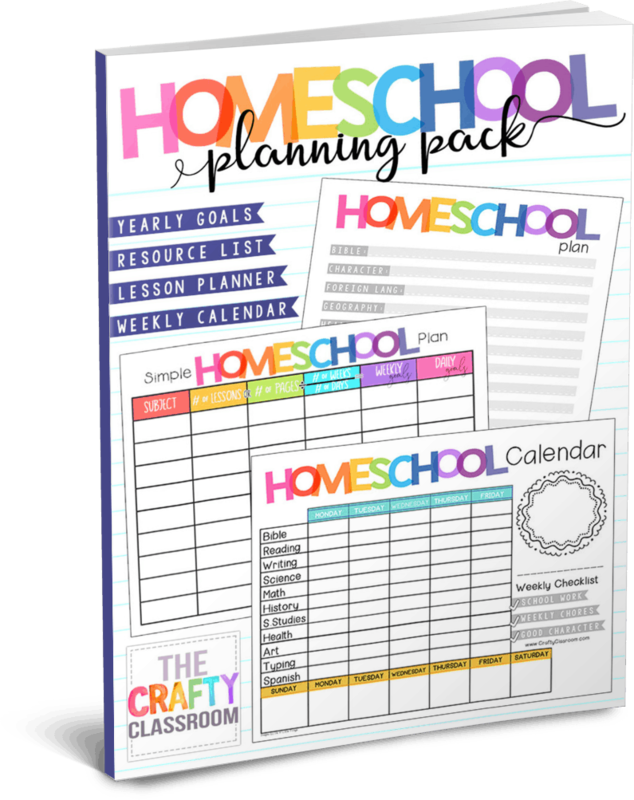 I know we’re mid-Summer, but if you’re like me you like to get a head start on some homeschool planning. 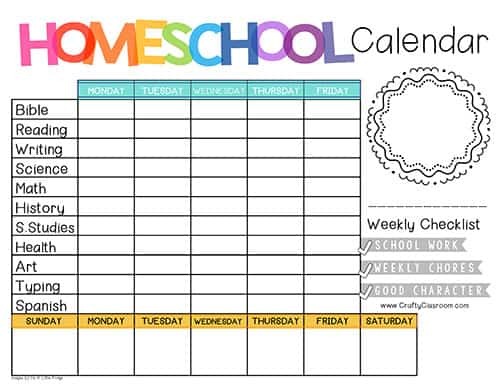 Today I have a super simple and updated version of our weekly homeschool planner. I’m not sure if you can count it as a planner because really it’s just a single page, but it’s worked for me for the past 5+ years and I think it’s the easiest planner around. You know I’m all about simple. There is a place for children to write their name, the week number across the top. 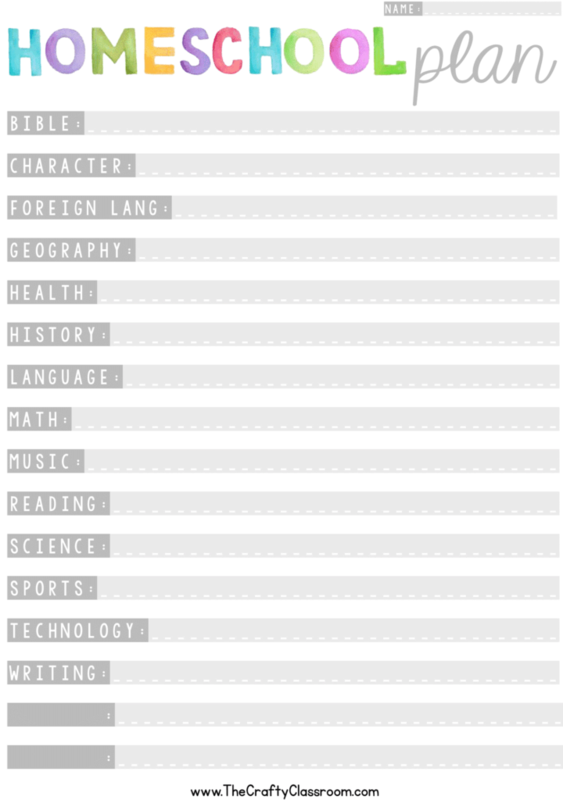 Subjects go in the left hand column, and daily assignments go across the row. There is a section for notes, as well as general life planning and after school events at the bottom. If you’re looking for a complete planner simply print up one sheet for each week then bind them together or keep them in a three ring binder. Because many curricula come with pre-scheduled assignments in the front of the book I actually have my children use this as a daily completion chart. 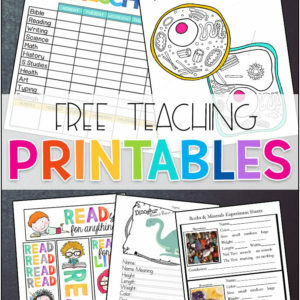 I laminate mine, hang them up on the wall and then as they complete each subject they check off their work for the day. I think this is a fantastic way to encourage them to take responsibility for completing their work, and it helps them to SEE what they have left to do for the day. 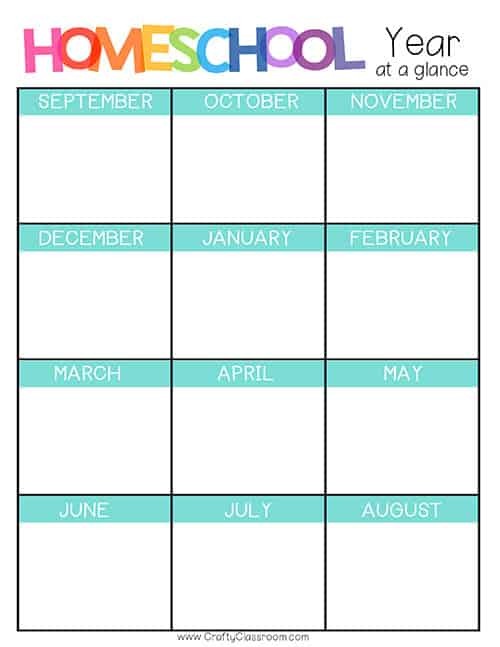 I created this planner to encourage children to keep track of their own schedules. Not just because I’m a little lazy when it comes to planning, but because I want my children to start to learning planning and organizing skills for themselves. That is the goal right. Little birds learning to fly on their own. 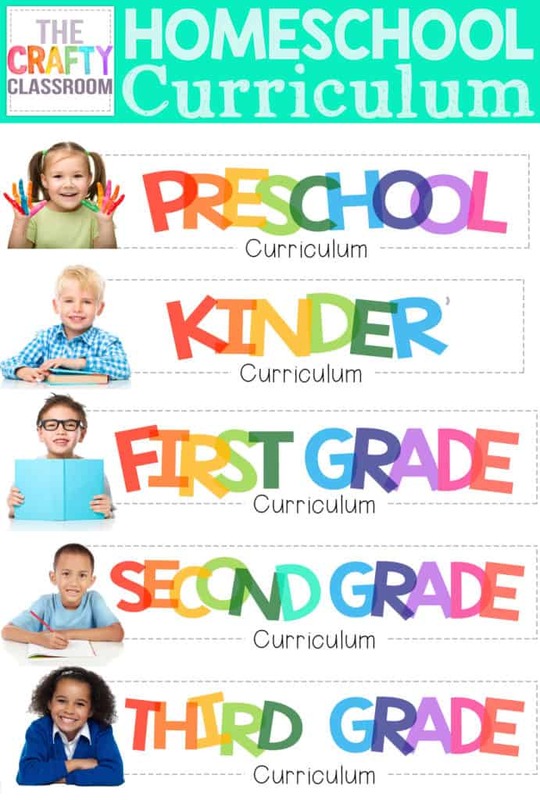 If you have younger children try our K-5th grade planner. There are boy and girl versions, blank and pre-written ones as well. Instead of the notes section the younger planners include a weekly box for a sticker when their goals are completed. Character.It is sooooooo hard to teach. Harder then math. Harder then science. 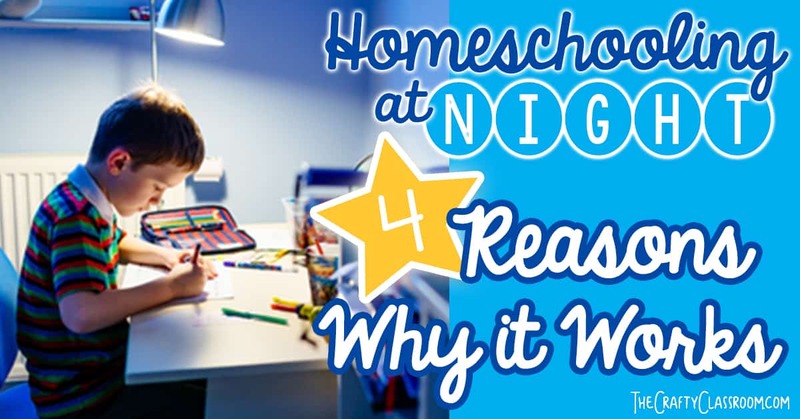 Character is on my TOP list of reasons why I homeschool. Character is a teach by example sort of subject. Can I just say without any reserve that the Character has been lacking around here lately. our house has turned upside down with more Negative then Positive reinforcement lately. Obviously, that is not going to work for very long. and virtues that (I’m hoping) we will see through out the week. The charts will hang up in the classroom where everyone has access to them. when the child displays that positive character trait. in one letter of the word peaceful. You can’t persuade anyone to fill in a letter for you. Try your best to SECRETLY fill in a letter for others, don’t let them see you! When you catch the babies/tot doing good, PRAISE, PRAISE, PRAISE them by naming the character trait and walking them over to fill in the letter. I’m hoping my children will get excited to see the new colored in letters each day. I’m sure by the end of the month we will all know what character traits we are struggling with. Yup. Giving myself the letter “b” for that move.